Asthma is a chronic disease in which your lungs become inflamed, your airways restrict and breathing becomes difficult. Symptom flareups known as asthma attacks may be triggered by allergies, stress, cold weather, physical exertion, viruses or smoke. In addition to medications, inhalers and doing your best to avoid potential triggers, a healthy diet, limited in particular foods, may prevent or lessen the severity of your symptoms. Dairy products, such as milk, cheese and yogurt, may worsen asthmatic symptoms. The texture and consistency of dairy products may exacerbate mucus production and congestion, according to Ellen W. Cutler, author of "Live Free from Asthma and Allergies," and make it more difficult to breathe freely. High-fat dairy products may worsen inflammation. To prevent these occurrences, limit or avoid dairy products and foods that contain significant amounts of milk, butter, cheese or cream. 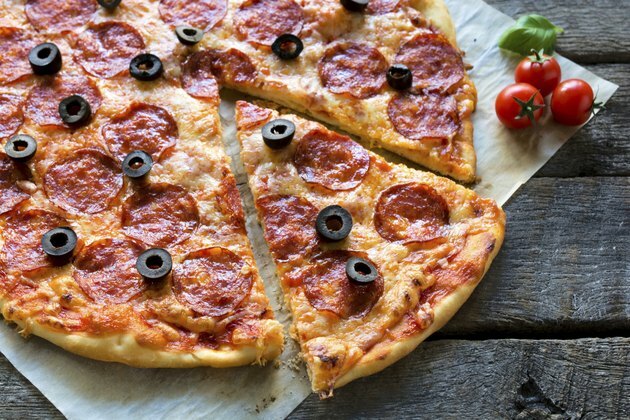 Foods and beverages high in dairy content include cheese-topped pizza, pasta Alfredo, creamy soups, cheesecake, nachos, ice cream, frozen yogurt, lattes, creamy smoothies and milkshakes. Fatty meats contribute rich amounts of saturated fat to your diet. According to research published in the "European Journal of Clinical Nutrition" in October 2010, saturated fat may contribute to asthma. In the study, the dietary habits and asthma prevalence of 639 Spanish children, ages 8 to 13, were tracked and analyzed for three days. Researchers found that children who consumed diets rich in saturated fat were more likely to have asthma than children who did not. Fatty meats may also worsen lung inflammation once you have asthma and make breathing problems worse. For improved symptoms, try replacing fatty meats with healthier protein sources, such as fish, skinless poultry and legumes. Citrus fruits and tomatoes, though valuable sources of fiber and nutrients, may also worsen asthma symptoms. Though foods affect people with asthma differently, Cutler lists citrus fruits and tomatoes as common symptom triggers. If you suspect acidic fruits such as these negatively influence your symptoms, try avoiding oranges, nectarines, grapefruit, lemons, limes, tomatoes and tomato products, such as tomato paste, sauce and juice. Since fruits provide antioxidants--nutrients that strengthen your immune system--incorporate nonacidic varieties such as berries, kiwi, plums, red grapes and mangoes into your diet regularly. Salt is used as a preservative and flavor enhancer in a variety of foods. According to Cutler, eating excessive amounts of salt can lead to worsened asthma symptoms and trigger attacks in some people. While sodium--a term used interchangeably with salt--is necessary for human health, most people reap sufficient amounts from healthy, natural foods. Thus, seasoning your foods with natural herbs or other low-sodium seasoning in place of table salt and avoiding salty processed foods is important. Foods particularly high in sodium include canned soups and chili, processed meats and cheeses, pretzels, potato chips, tortilla chips, crackers, frozen entrees, canned fish and vegetables and gravy mixes.